The simplicity and elegance of Straight Eave Glass Sunrooms proves that less really is more. A Straight Eave Sunroom will not only provide your home with additional space, it will also add elegance and value. With a variety of styles and finishes available, Total Remodeling Systems can customize a sunroom addition to match any style of home. 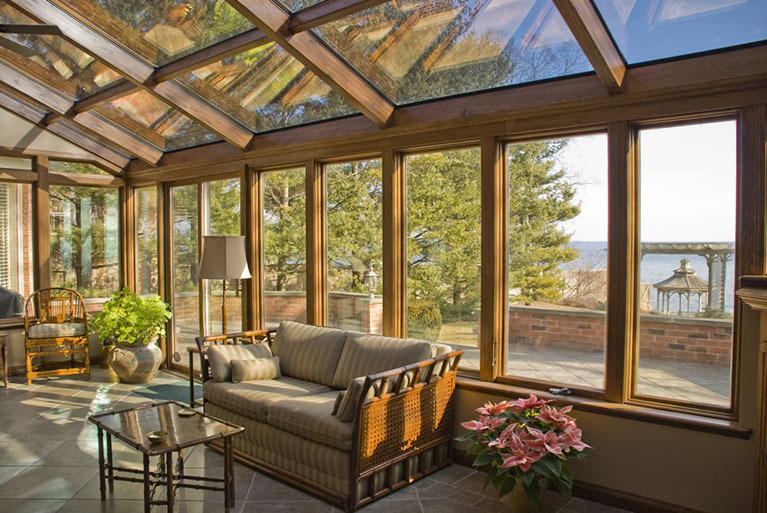 Bring the beauty of the outdoors in year-round when you add a glass sunroom to your home. Incredibly versatile, Total Remodeling Systems can seamlessly integrate a sunroom to match any home’s style. Whether you are looking for a traditional or contemporary sunroom, there is a Straight Eave design to suit all tastes. Finished aluminum interiors and exteriors provide a more modern look while natural wood interior beams provide a warmer, classic style. A variety of doors, windows and color choices gives you even more ways to customize your sunroom and match your home’s unique style. Add charm to your sunroom with full view French doors or choose to add some drama with quad doors, which feature twice the open space for an impressive effect. Continue to personalize and perfect your design by choosing what type of roof the room has. Sun and Shade Glass styles feature a solid, insulated roof. For a more open concept, there is the Sun and Stars model constructed of patented Four Seasons’ CONSERVAGLASS SELECT™. This option features a glass roof and is ideal for people looking to kick back and soak up the sun. No matter which roofing option you choose, both Straight Eave styles are energy efficient, low maintenance and provide year-round comfort. Total Remodeling Systems is proud to stand behind our home remodeling projects because we are confident in our quality, local, American made products, our experienced, professional craftsman and design work. We offer product warranties, free consultations, financing programs and both senior and military service discounts. Learn more about our commitment to exceptional quality and satisfied customers by contacting Total Remodeling Systems today!